American School of Classical Studies at Athen, 9780876615195, 219pp. 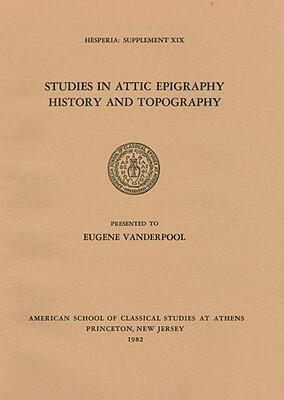 Twenty-six papers on the epigraphy, history, and topography of ancient Greece presented to the famous scholar by his eminent students and friends. The contents are: A Lid with Dipinto (Alan L. Boegehold); Athenians, Macedonians, and the Origins of the Macedonian Royal House (Eugene N. Borza); Koroni and Keos (John L. Caskey); Epicurus in the Archives of Athens (Diskin Clay); The Nature of the Late Fifth Century Revision of the Athenian Law Code (Kevin Clinton); Theseus and the Unification of Attica (Steven Diamant); Onesippos Herm (Colin N. Edmonson); Gennadeion Notes v. the Journal of Thomas Whitcombe, Philhellene (C. W. J. Eliot); A Lekythos in Toronto and the Golden Youth of Athens (Henry R. Immerwahr); The Leasing of Land in Rhamnous (Michael H. Jameson); Writing and Spelling on Ostraka (Mabel L. Lang); Some Attic Walls (Merle K. Langdon); Dodwellopolis: Addendum to Fortified Military Camps in Attica (James R. McCredie); Athens and Hestiaia (Malcolm F. McGregor); Thucydides and the Decrees of Kallias (Benjamin D. Meritt); Arrian in Two Roles (James H. Oliver); The Dedication of Aristokrates (Antony E. Raubitschek); The Pnyx in Models (Homer A. Thompson); The Alleged Conservatism of Attic Epigraphical Documents: A Different View (Leslie Threatte); Agora I 7181 + IG II, 2, 944b (Stephen V. Tracy); An Interpretation of Six Rock-Cut Inscriptions in the Attic Demes of Lamptrai (John S. Traill); PARADEIGMA (John Travlos and E. L. Smithson); Regulations for an Athenian Festival (Michael B. Walbank); The Final Battle at Plataia (Paul W. Wallace); An Attic Farm near Laurion (Livingston Vance Watrous); Sepulturae Intra Urbem and the Pre-Persian Walls of Athens (F. E. Winter).